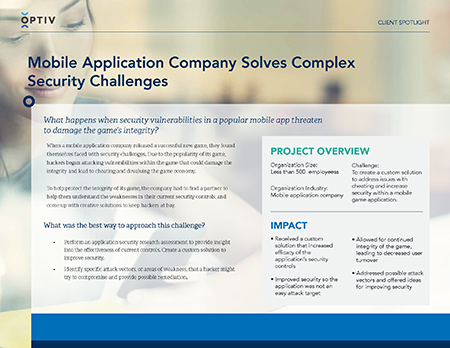 When a mobile application company released a successful new game, they found themselves faced with security challenges. Due to the popularity of its game, hackers began attacking certain vulnerabilities within the game that could damage the integrity and lead to cheating and devaluing the game economy. To help protect the integrity of the game, the company turned to Optiv. Read more to learn how Optiv performed a successful application security research assessment and created a custom solution to improve security.